To continue my last post about Babe  where I wrote about a little of its history, in this new entry (I’ve now switched from the KDE blogs to Medium) I will tell you about the current state of Babe and the features implemented so far. 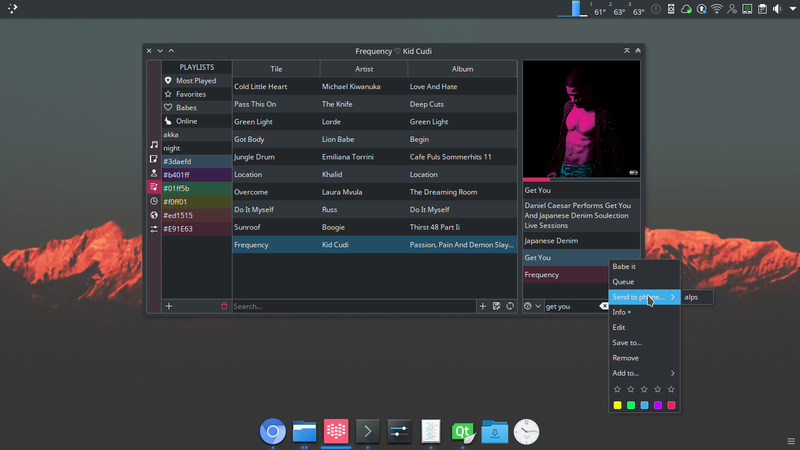 To start: In the last post I wrote about wanting to make in the first place a tiny music player, and that’s why I first started the GTK3 version of Babe and tried to make it look like a plain playlist highlighting the cover artwork. The now present version of Babe still sticks to that idea, but also, to make of it a more powerful music player, it has an integrated music collection manager, with different views and features. One of the core points of Babe is the Babe-it action. Babe-it basically means make a track a favorite and put it in the main playlist. A Babed track is a new hot song you really dig for now, like a new song you found on YouTube and added to your collection via the Babe Chromium extension ;). The Babe-it action can be found on the contextual menu to mark as babe any track on your collection and also in the playback toolbar controls to mark as Babe the current playing track. Also via the native KDE notification system you can Babe or Un-Babe the current playing song without having to interact with the babe interface. 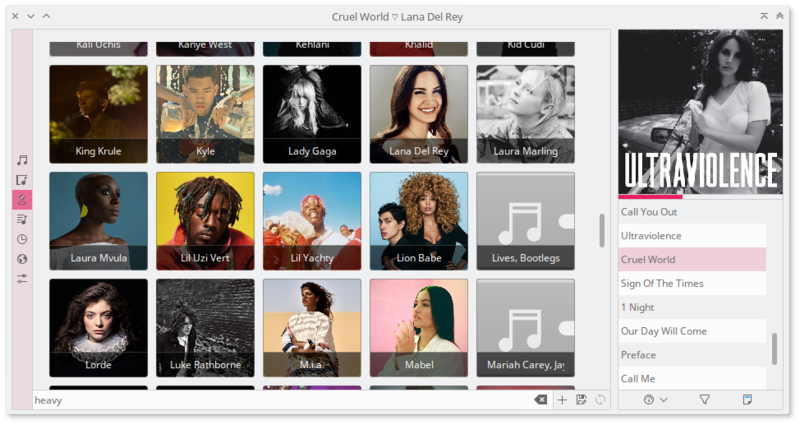 When you first launch Babe it will make use of the called “Playlist Mode”, but in the case scenario where there is not music to play, then it will change to the “Collection Mode” to let you add new music sources or drag and drop music tracks, albums or artists. Babe also has a “Mini Mode” that just displays the artwork and the basic playback functions. Collection Mode where all the collection manager views are visible: all tracks, artists, albums, playlists, info, online and settings view. At the left you found the views toolbar and at the bottom the so called “Utilsbar” where all the useful actions for each specific view are placed. Playlist Mode where only the current tracks on the playlist and the artwork on top are visible. 1- the calibrator, which allows you to: clear the list and only put your Babes on play, to clear the whole list to put together a new playlist, to save the the current list as a playlist, to use a different playlist from the ones you already created and finally to remove the repeated songs from the list. 2- a go-back button which takes you back to the view you were before at the Collection Mode. 3- a filter option that will let you quickly put on play your search queries without having to go back to the Collection Mode. Search queries can go like this: “artist:aminé,artist:lana del rey,genre:indie” or simply “caroline”. Mini Mode that only displays the artwork and the basic playback functions. You can browse your collection by all tracks, albums, artists or playlists. Also there is a playAll button that shows when hovering the artwork, when pressed it will clear the main playlist and started playing all the tracks from the artist or from the album, depending of which type of artwork was clicked. And finally set a color mood for the track. Tracks with a colored-mood can color the interface. By making use of the Babe Chromium extension you can fetch your favorite YouTube music videos and add them to your local music collection. Babe will find relevant information to catalog them and the add them to the main playlist for you to listen later on. The info view is going to be the main focus point on future development, the main idea for Babe is to become a contextual music collection manager, that meaning that Babe will let your discover new music based on the tracks you collect and listen to, and also show you contextual information about those. This is another focal point for babe, but I will cover this one in a future blog post. Hope you like and I’m hoping to read about what you think and your ideas. This looks great I only stumbled upon it via elisa blog, why is it not better known? I love the management aspect and integration. Where is metadata for songs being pulled from and where will the recommendations/discovery of new tracks be derived from? Please could you release a webextension for Firefox? Is there any plans for a mobile version?